I use these Amuse Twinklers Micro and Mini dots a lot. They really step a CAS card up a notch. 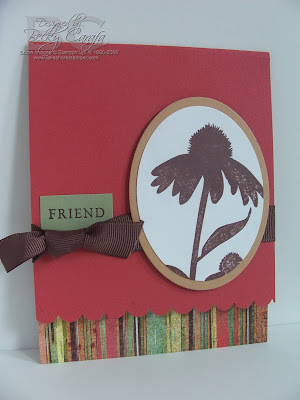 Supplies: Stamps - Verve, PTI; Paper - PaperTrey Stampers Select; Ink - Palette Noir; Misc - SU! 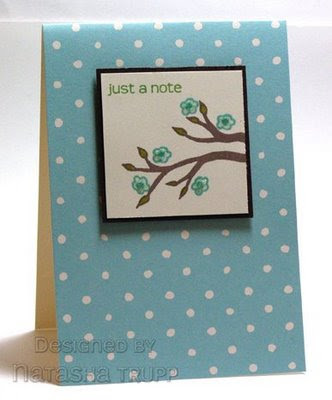 Markers, Score-Pal, Cuttlebug Border Embossing Folder, Amuse Twinklers Micro dots. I embraced bling today with these glittery stickers by K & Co. They are much more glittery and the letters much more subdued in color in real life. Thickers letters by American Crafts, ribbon by Papertrey Ink. Natasha and I had similar ideas, lol! I clustered my flowers a bit more than the sketch shows, and layered them. What a fun and quick sketch! This took me about 10 minutes to make. The embellishments were already put together - found them in the $1 Spot at Target. 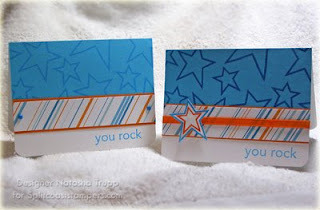 Supplies: Stamps - Hero Arts; Ink - Memento; Paper - PaperTrey Stampers Select, Bazzil; Misc - Nestabilities, ribbon, 3D stickers. It's time for another sketch. This one works really well for simple cards or if you want something a bit more. It all depends on your layers and your other elements. I planned to use flowers as my dark element when I designed the sketch. However feel free to use anything there, circles, stars, whatever! A small tip, when adding in elements it's a good idea to keep to odd numbers. In my sketch I have 8 flowers plus the sentiment equally 9 (obviously an odd number). I have to say, I quite like this sketch and use variations of it often. Here's my card, I timed it, it took 15 minutes. The longest part? Attaching the brads to the felt flowers. Tips: Change up your dimensions! This week's tip is to change up your dimensions! By this I mean step outside the 4.25x5.5 box. No squares either! 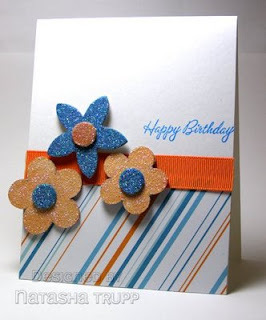 Making cards with different dimensions really allows you to use your supplies differently. Maybe you have a large alphabet set you are dying to use, but it's too big for a standard size card. Try a bigger style card. Maybe you have some really big primas that would work well on a larger format. On the other side of the spectrum, maybe you have some cute, but tiny stamps. They would go nicely on a smaller format, perhaps you'd want to look into using the notecard size. Popular sizes include the 6x3 or 7x3.5, the 3.5x5, I've even had fun with 6x5 cards. 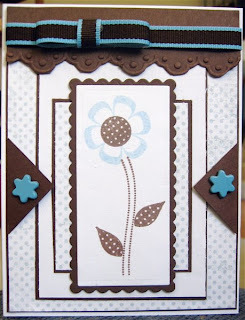 For my card today I went with an A Muse 4 bar blue notecard. These ones measure 5 1/8"w x 3 5/8"h. They work really well with the slightly smaller size of the A Muse stamps. This card was definitely on the quick side. I cut a 2 inch vanilla square, stamped my scene and sentiment (both from the Sushi clear set) . I coloured in the leaves and flowers with Copics and then applied a thin coat of stickles. I stamped the owl and colored her in with copics. I blinged up her hat and glasses with stickles, too! I created the sentiment with alphabet stickers and added a few large brads at the top. I was looking for number stickers to use on graduation cards and found some of these sparkly foam stickers at Michaels. They added a lot of dimension to this card. 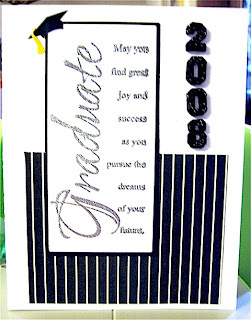 Supplies: Stamps - Paper Inspirations; Ink - Versamark; Paper - Papertrey Stampers Select, DCWV All Dressed Up; Misc - Silver Glitter embossing powder, Mrs. Grossman's sticker (grad cap), Number stickers (unknown). Alphabet or number stickers! There's loads of styles, textures, and fonts out there. We all seem to have them, let's use them on a clean and simple card! These stickers are what I like to call "no-name thickers". They are foam stickers from the dollar store. They are decent quality and sometimes there is even a decent selection available! Underneath the numbers the phrase "it's your day!" is stamped. This week's sketch is intended to be for a longer style card, something along the lines of 3.5x7 or 3x6. It's pretty straight forward. For once, the strip in the middle is not necessarily knotted ribbon! 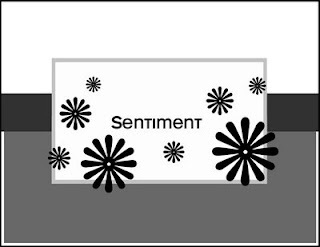 Feel free to change the shape or dimension of the circle and the sentiment placement. I recently went to Michaels and was inspired by all the fun Halloween product. 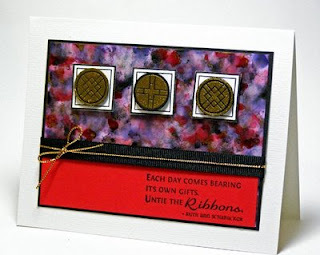 I went into my Stampin' Up! paper stash and pulled out this paper from last year. I still really love it, so I have been using it sparingly. 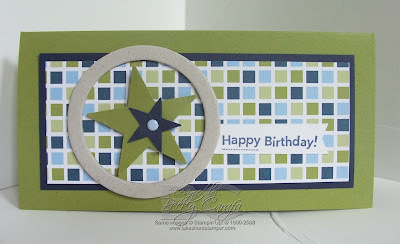 Whenever I make long style cards I find that I like to use my corner rounder on at least 2 of the corners. 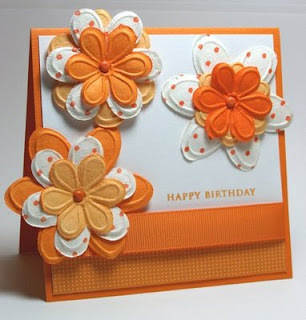 It just seems to add a nice finished touch to this style of card. 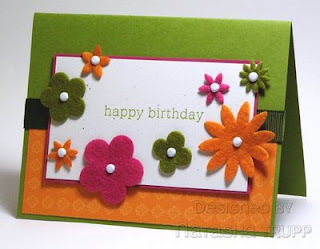 Here's another card featuring my favorite complimentary colour combination. I was in the the mood for glittery flowers, so I inked up some chipboard, covered them with Mod Podge, then sprinkled on the glitter and went from there. Colours can really be a wonderful starting point when you're having a motivation slump. Complimentary colours are one of those nice combinations that you can rely on. If you choose 2 colours that lay across from each other in the colour wheel, it will generally be pleasing to the eye. One of my favorite complimentary colour combinations is orange and blue. I cannot get enough of it! When I saw this Scenic Route paper from last season I had to have it because of its lovely blue and orange tones. Something to keep in mind, be sure to keep things in the same tone. If you're going with a dark green (say hunter green), it will pair better with a dark red (like crimson). If you're going with an earthy orange or rust, they will look better with an earthier blue. It's important to keep those undertones and brightness in mind when going with that colour selection! In keeping with the glamorous style this week, the fall-to colours are all things metallic. Gold, silver, bronze, anything that has that extra sparkle or sheen is game! 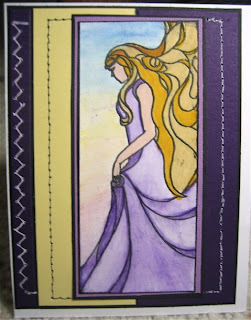 This is a card I made while on the Dirty Dozen. 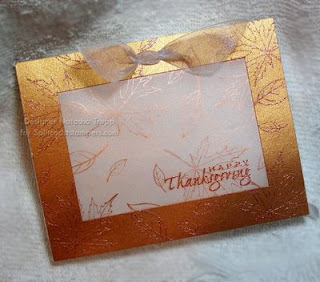 The frame was made from some copper cardstock, I embossed the leaves on that in copper EP. I stamped the leaves on the vellum layer with versamark, then brushed some Copper Pearls over top. The greeting was also embossed. I added in a bit of organdy for that extra bit of elegance. 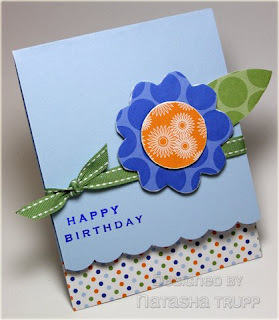 Stamps: Lizzie Anne Designs and Stampin' Up! Polished Stone This is one of the first stamping techniques I ever learned. I thought the result was so stunning that I had to have the supplies immediately. For this technique, check out HERE for a step by step guide. The only thing I do differently, is I put ALL the reinkers on the soaked cotton ball. There are several reasons I consider this a CAS friendly technique. You can do a whole 8.5x11 sheet very quickly. Cut it up and place on several cards. 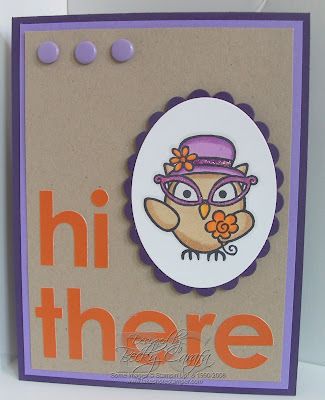 The versatility of looks you can get make it great for virtually any kind of card. Minimal supplies needed, and if you don't have them, they are relatively inexpensive and they go a long way. 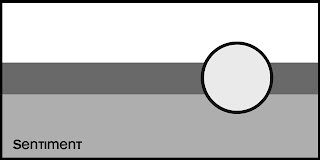 The look that is achieved with polished stone is conducive to a CAS type card. You really don't want to cover up all that pretty patterned paper you just made! I love using ribbon. 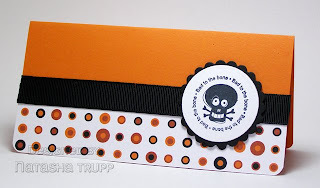 This ribbon has a layered look but is only a single layer. 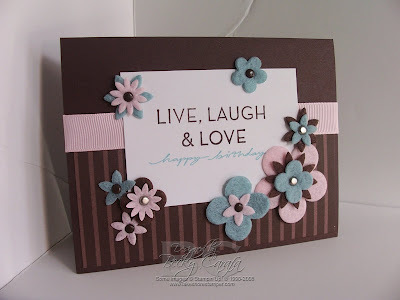 I made this card for the Verve Anniversary Sketch #3 and uses more layers than I normally use for a CAS card but I used this pretty ribbon so I thought I'd post it. 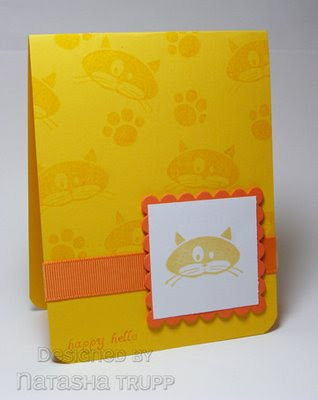 Supplies: Stamps - Verve; Paper - PaperTrey, MME dp; Ink - Momento; Misc - Gorsgrain ribbon, MM Brads, Nestabilities, Cuttlebug Border embossing folder. I just got this beautiful 6x6 paper from Memory Box called Grove and wanted to use it on today's sketch. So I decided to put the patterned paper on the main part of the card front instead of showing underneath (where the green is). 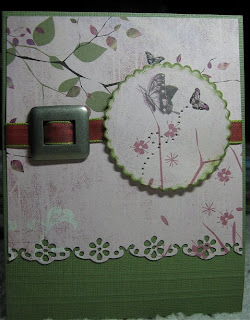 The only stamping here is the larger butterfly in the scalloped circle. 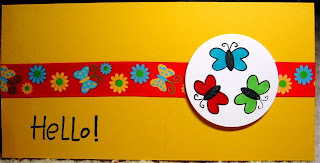 I also pierced the flight path of the smaller butterfly that is printed on the paper.I used my Martha Stewart border punch to make the scallops and my Nestabilities to punch out the scalloped circle. I edged the circle with Momento Bamboo Shoots ink. I used my Scor-pal to make 2 sets of parallel scores along the bottom and left off a sentiment until I decide what to use this for. 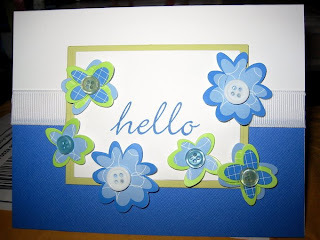 Supplies: Stamps - Hero Arts Designer Butterflies; Ink - Momento, Pallette Noir, SU! Pale Plum; Paper - DCWV Card stock, Memory Box Grove; Misc - piercer, Nestabilities, May Arts ribbon, MM ribbon slide, MS border punch, Scor-pal, dimensionals. So here is this week's sketch. I really like using this one when I want to show off a bit of patterned paper. 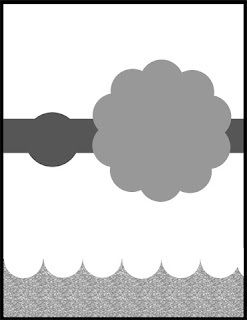 As usual, my rectangle strip with the circle represents some sort of ribbon and knot or bow. However, feel free to put some sort of embellishment there instead! For my card today, I went with some "old friends". 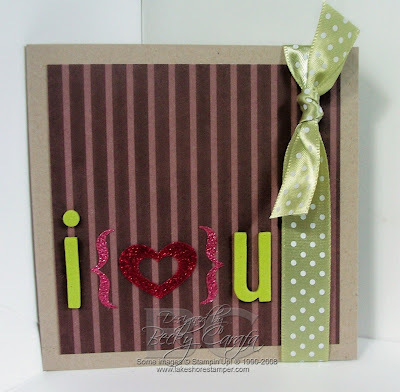 This card is all Stampin' Up! I even did the scallops using the corner rounder instead of my nestabilities! 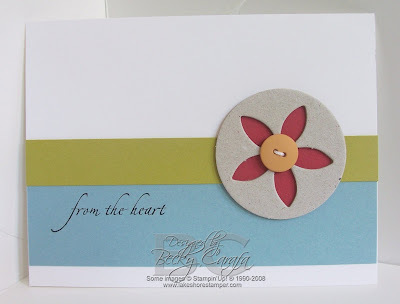 For my scalloped circle I went with a patterned paper covered flower. It's so nice to choose 4 different papers that you know are going to coordinate nicely! I've been on a bit of a chipboard kick these past few days. I have so much of it, and it really covers up or inks up nicely! It's a pretty quick process too! For these ones, I didn't feel like dealing with Mod Podge, so I taped the paper on. Speaking of using the chipboard I have... I'm trying really hard to use more and more of all the stuff I have. I think it's really good to step back and evaluate all the stuff you have. Figure out new ways to use your supplies before going out and buying more! If you can use a certain supply for a quick CAS type card, all the better! It'll give you more motivation to use that supply again and make more cards! Remember, if you want to play along, put a link here or use the keywords FTL8 at SCS! 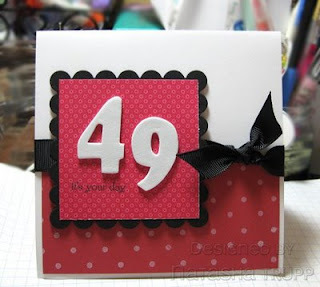 Repeating an element on a card is a really quick and easy way to unify your theme. There are several different ways you can do this, listed below are just a few ways to use repetition to your advantage. You can use a shape, such as circles or squares, for your repeated element. 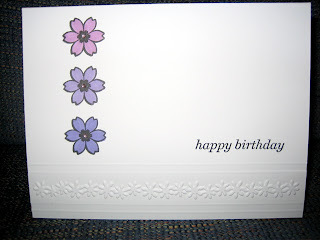 You can use a specific theme as a repeated element, say all flourish type stamps. 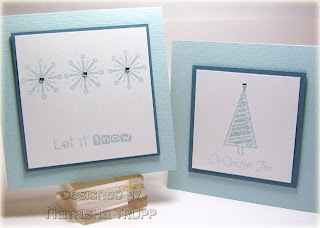 You can use the same stamp over and over to make a background, then use it again for your focal point. You can even use a monochromatic colour scheme as your repeated element.